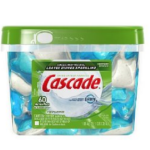 Amazon is offering a Cascade ActionPacs, Dishwasher Detergent, Fresh Scent (60-count Container) for $10.97. Save an extra 5% with Subscribe & Save which drop the price to $10.42 + Free shipping. Plus you can clip $1.00 off coupon and get these for $9.42 shipped.